I have been a petrol engine Mercedes saloon driver for over 40 years. My current E280 with petrol V6 is a delightful, smooth and well balanced car. I have been waiting for 18 months for a petrol engine new E-Class 4-door saloon but alas Mercedes UK will not be importing the petrol E300 or E400 into the UK despite being available in every other European market and the USA. So I am left with the E43 AMG 3 litre twin-turbo petrol engine and test-drives I have read comment on the choppiness of the ride, especially over poor surface. My own 15 minute test-drive at the dealer confirmed the firmness of the ride, but we did not cover any poor surfaces. I am told using 19 inch wheels and deeper profile tyres will improve the ride. Do you think this is true? Any other ideas to improve the ride? Have you driven this car? 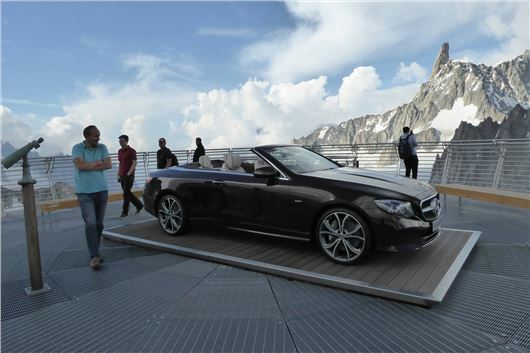 I recently tested the E200 and E220d cabriolets here: /road-tests/mercedes-benz/mercedes-benz-e-class-cabrio-2017-road-test/ The adaptive air suspension makes up for some of the tyre stupidity, but, of course, doesn't pay for potholed and kerbed tyres and rims. The reason for restricting availability of the 200E and 300E is EC fines for corporate average CO2 over 130g/km. This is easier to achieve with diesels that emit on average 20% - 30% less CO2. EC fines per car amount to: €5 for the first g/km over 130g/km; €15 for the second g/km; €25 for the third g/km; €95 for each subsequent g/km. From 2019, the cost will be €95 from the first gram of ‘exceedance’ (Eurocrat word) onwards. Manufacturers selling between 10,000 and 300,000 cars per year (such as JLR) can apply for a fixed target of a 25% reduction from their 2007 average emissions for 2012-2019, and a 45% reduction from the 2007 level as of 2020. Could you advise please regarding purchase of a satnav for domestic use? I’ve received an interesting letter and leaflet from Groupe Renault (Dacia) telling me how at no charge I “can benefit from the latest software developments aimed at reducing emissions of nitrogen oxides from your Euro 6b vehicle in real life driving conditions.” My Renault engined Dacia Duster, with which I am very pleased, is only 8 months old. The letter and leaflet stress the benefits of the free update, but significantly fail to make any comment of the effect on other, perhaps more critical performance factors to owners, including economy – which I suspect would not be to owners’ benefit. My suspicious mind causes me to wonder that if, after many years of using the ridiculous EU testing rules to allow them (and other manufacturers) to quote unrealistic MPG performance data, together with the more recent VW/Audi Group emissions scandal (which still hasn’t gone away) is causing Goupe Renault to ‘clean their slate’ with the establishment bodies, while not being entirely transparent with their customers about other potentially reduced performance effects. Do you believe Groupe Renault is being cynical in its offer – or am I the cynical one? Other readers with other Alliance models fitted with the 1.5DCI engine have received the same message. I am not yet aware of any adverse post-fix repercussions. The problem with VAG cars post NOx fix seems to be restricted to those with high mileage, or that have not been maintained properly or that have been running on cut price junk diesel. Just a trivial thing, but If I am parked up in my 2008/58 Citroen C5 estate, waiting to pick someone up, etc., and I wish to listen to the radio, after about a minute or so a message on the dash display reads battery now in economy mode and the radio cuts out (along with the ability to use wipers and open or close windows). This means I would have to have engine running if I wish to continue listening to the radio, something I don’t want to do because of the pollution it creates. Is there any way I can override this? I can’t find any information in handbook. No, because this, is, a built in economy feature to prevent you running down the battery to the extend that the alternator and therefore the engine have to work hard to put the charge back in. Sitting in the car listening to the radio is not an option. You can always use the radio function on your smartphone. I have a Peugeot 3008 Allure HDI that is due its first MoT later this year. I would like to change it before this MoT for a similar make, but a petrol fuelled car. I like many of the features in the 3008 including the slightly higher driving position, satnav, electromechanical parking brake, good head height clearance, rear split tailgate, adjustable rear storage shelf. Because I a lot of walking/camping it makes for good loading and unloading of gear. Are there any other make of petrol fueled car with similar features you can suggest that I could consider? I purchased a new Mercedes GLC 250d AMG Line 4matic car in October 2016. In March 2017, the whole car shuddered when the brakes were applied. Mercedes replaced the front and rear brakes. They would not explain why it was necessary. They had the car back for 1 month. In May 2017, the shuddering started again. Mercedes had the car for 6 weeks. They stated that it required new bearings on each corner, new hubs on each corner and new front and rear brakes to replace the ones fitted in March. They would not give any reason as to why this had happened. They then replaced my car, giving me a new one to the same specification as the original new one I purchased. Is this likely to happen again to my new car? We are first time caravaners at age 70+. We would prefer a petrol engined tow vehicle for a caravan with a gross payload of 1,310kg. Do you have any suggestions please? A Suzuki Vitara S 1.4 Boosterjet 4WD or (cheapest) a Dacia Duster Laureate 1.2 TCe 124 4WD: /road-tests/suzuki/suzuki-vitara-s-boosterjet-2015-road-test/ or /road-tests/dacia/dacia-duster-laureate-tce-125-2016-road-test/ Just remember to idle the engine after towing for a minute or tow before you switch off to keep oil circulating through the turbo while it spools down. I have a 2012 KIA Sportage LX 4WD with 30,000 miles. It won't start. Stuck in no crank/no start. I replaced the brake pedal switch. Still no start. All dash lights come on normally when I put the key in. Then as soon as I turn it over when the Auto light comes on there's a green symbol of a car on a steep incline that changes to red and the motor shaped icon starts flashing rapidly 100 times then stops flashing until you turn key. I'm lost. There's the negative battery sensor cable. I don't know if that causes it. I think it just controls the alternator when and when not to charge. Then there's a dump vehicle forward position sensor right under the cup holders and it been wet quit a few times by look of it, but also looks like a sealed piece. Please help. I have owned and driven Honda Cars for the last 30 years with true satisfaction. At the moment I am still driving a Honda Civic Executive SE 1.6 VTEC that I purchased new in March 2004 and that has now done 106,000 miles. I have it serviced regularly every year and it still runs very well without any problems other that a slight noise in the gearbox (used to be called tappet noise), but that has been there for over 4 years now and has got no worse and, as I say, very slight. I am now 75 years old and if I change it, what model of car do I look at to give me the same amount of room: CR-V or the HR-V and, although I am a Honda man, I must look at other makes if you advise. My wife (the passenger) sometimes finds it difficult to get into and out of the car, so I will need to have a car that would be OK for her. As for performance, I must say the Honda VTEC engine in the Civic I drive gives me fast and speedy and secure driving for a 1600 engine, so that will also be a big consideration for me. Unfortunately, while your car is still good, it's 13 years old and consequently is only worth about £1,000; less as a part-exchange. Probably the best way to advertise it is a photo ad in a local newsagent's window. Try £995. The Honda HR-V 1.5 manual is not very sprightly. It really needs a turbocharged engine. The HR-V 1.4 CVT is longer geared and quieter at speed but fairly sluggish on hills. The best is the 1.6iDTEC, but that's diesel and only really makes sense if you do a high mileage. You'll probably be better off with a Suzuki Vitara S 1.4T BoosterJet 4WD, which is sprightly, quite economical and suitably high off the ground, but obviously your wife needs to try getting in and out of one before you commit. I've got a question regarding a 2013/63 Citroen Berlingo. While driving back through France, it stopped being able to engage 5th gear. It turns out that the dog teeth on the 5th gear assembly had broken and it now needs a lot of work. The car is 3.5 years old and just out of warranty. An independent mechanic has told me that this is a fairly common fault with Berlingos and also Peugeot Partners. There seems to be some chat about this online, but Citroen is denying it. Are you aware of this being a common fault with this model? Thank you. I think this is the first I've heard of it. I will record it in the car by car entries in our vans section where there will be any more prior reports. This has a Dualogic automated manual transmission and it reads as if the activator might have failed. Thank you very much for your advice and comment about the replacement turbo on my 2012/62 Skoda Yeti. I deliberately withheld a reply until the work was done and we had better idea of the cause. While I was aware of the need to allow turbo diesel engines to idle after journeys to cool the oil, it is apparent talking to friends who own similar vehicles that they were unaware of this fact. I have scanned and attached the invoice for the work done to replace the turbo unit and oil pipes. What did surprise me was that - talking to the engineer - the oil pipes were perfectly ok with no evidence of carbonisation of the oil. From what I can interpret from the invoice and talking to the fitters, it was a failure of the turbo itself. Many thanks for sending me the invoice. Seems very clear that the turbo simply failed and not because the oil feed and oil return pipes had become blocked with carbon. I think this is unusual and therefore worth applying to Skoda for some goodwill towards the repair because the fact that the oil feed and oil return pipes were not blocked confirms that you were looking after the engine and not abusing it in any way. I bought a new Toyota RAV-4 diesel 3 years ago. At the time, I intended to tour a lot but this hasn't happened for a variety of reasons. I need to change for a petrol or electric as we now undertake a lot of short journeys. We like the easy access and the driving position. I would welcome your suggestions. I have a Hyundai i10 that is two years old. Recently it underwent an annual pre-paid service. I also brought to their attention that the vehicle appeared to have become noisy on the front. Subsequently, and unexpectedly, I received a telephone call to tell me that: the front brake discs needed replacing; both front tyres were feathered on the inside edges and needed replacing; and the front left wheel-bearing needed replacing. I allowed them to replace the discs and pads and to change the wheel-bearing but declined to have the tyres replaced. The wheel-bearing could not be done at this time despite having the car all day. When I went to collect my car a week later it was not ready as the dealership said they had difficulty getting the bearing off. Is this pertinent? I asked myself. In the meantime I had the two tyres replaced by an outfit I trust with my tyres and brakes. I expected the tracking to be out as the tyres were feathered. This was however not the case and the tracking was perfect. When I took the matter to the dealership for an explanation as to why the tyres had become feathered if the tracking was fine, I was told what I consider to be a lot of evasive rubbish. I was told that: It is not unusual for brake disc pads to wear down inside 16,000 miles; tyres wear out in this way all the time; the roads in Macclesfield (my home town) are brutal and this could explain the feathering. 16,000 miles for the life of a tyre is a throwback to the days of crossply tyres.16,000 miles for a set of brake pads is a lot less than I would normally achieve but, what has really puzzled me is: why would the tyres be feathered on the insides edges if the tracking is perfect. Is it really the case that all of these faults are related (worn brake discs, a worn wheel-bearing and tyres feathered on the inside edges), especially as the car has only covered 16,000 miles and is only two years old. I would appreciate your comments on all of this. Other than these issues the car is brilliant and I’m very happy with my purchase. The usual reason for feathering of the inner shoulders of car tyres is straddling speed cushions which savagely abrades the inner shoulders of the tyres, leaving the driver unaware because it is hidden damage. Brake discs and pads do not last very long on this car.